KÃƒÆ’Ã‚Â¤rcher pressure washers can help make short work of a wide range of cleaning tasks, saving you time while delivering great results. From tough jobs like cleaning stonework, walls and wooden decking to garden furniture and more delicate surfaces like car exteriors, using a high quality pressure washer can make the dirtiest jobs easy. A trigger gun attachment is a convenient way to use your pressure washer, giving you complete control of the task at hand. If your old trigger gun has started to leak, been lost or damaged, or youÃƒÂ¢Ã¢â€šÂ¬Ã¢â€žÂ¢re simply looking to upgrade to a new KÃƒÆ’Ã‚Â¤rcher pressure washer gun, then this is the ideal replacement. 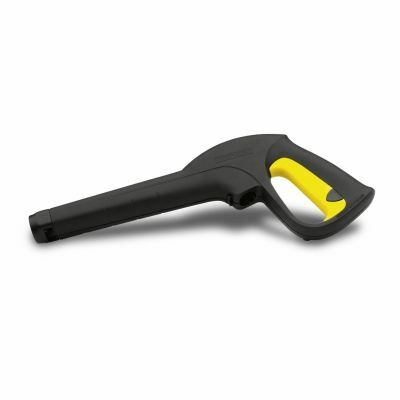 The replacement pressure washer gun is suitable for all pressure washers where the hose is secured to the gun with a clip or clamp. These include the K2 Compact, K2 Home, K2 Compact Home, K2 Premium Home and the K2 Compact Car & Home. The replacement gun is also supplied with a new replacement clip.